It’s sometimes been said that the Jewish holidays revolve around food (or the lack thereof). We eat apples and honey on Rosh Hashana, fast on Yom Kippur and don’t eat bread on Passover. Chanukah is no different. Since, on Chanukah we celebrate one day’s worth of oil lasting eight days, the traditional foods involve items fried in oil. Sure, they might not be the healthiest foods for you, but potato latkes and jelly donuts are quite delicious. We even have a sort of Christmas day food tradition. Since they are the only places open, we go to a Chinese restaurant. 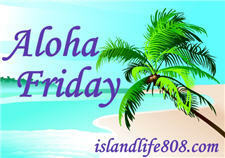 My Aloha Friday question for today is: What are your family’s food traditions for this holiday season? We don’t have any set in stone traditions. We usually play it by ear. We usually celebrate Christmas Day with a ham dinner and I make lots of baked good during the month of December. I enjoy our family holiday traditional cookies and other favorites that I now make with our grandkids. A few years back my husband was working a flight to Chicago over Christmas and I tagged along. We thought we would go to a nice restaurant for Christmas dinner but nothing was open except for a delightful Jewish delicatessen. We enjoyed some of the best food we’ve ever had! It has since become a fond memory of a freezing Christmas evening with vacant streets and wonderful food. We have a ham for Christmas dinner and we make peanut-blossom cookies for Santa Clause! We usually go to a restaurant for Christmas dinner. Our is the Latkes and Meats cooked in Olive oil.I try to have a different meat each of the eight nights. The first night we had Turkey, Last night we had Lamb briquettes in olive oil , Tonight we will have Chicken rubbed with olive oil and bitters. And Latkes each day. My daughter said I would love these all the time. I told here only on Hanukkah, it a special dish that makes this season exciting. This year she help make them. We celebrate about everything here. I can relate to the Chinese food thing. My grandmother always bakes cookies with the grandkids before Christmas and there is always an orange in the stocking. That’s pretty much it though. Love your blog – seems we have some things in common. As for Hanukkah, we eat latkes, try to avoid obsessing around gifts, light candles and talk about the darkest time of the calendar, sing songs…and eat more latkes. Visit the site and try some non-traditional latkes. They’s have you asking yourself – why don’t we eat these things more often? Then check out http://holykaw.alltop.com/how-fat-is-america-infographic and you’ll know why. I’m afraid that our dinner courses change but we always bake! We also make chocolate covered pretzels.